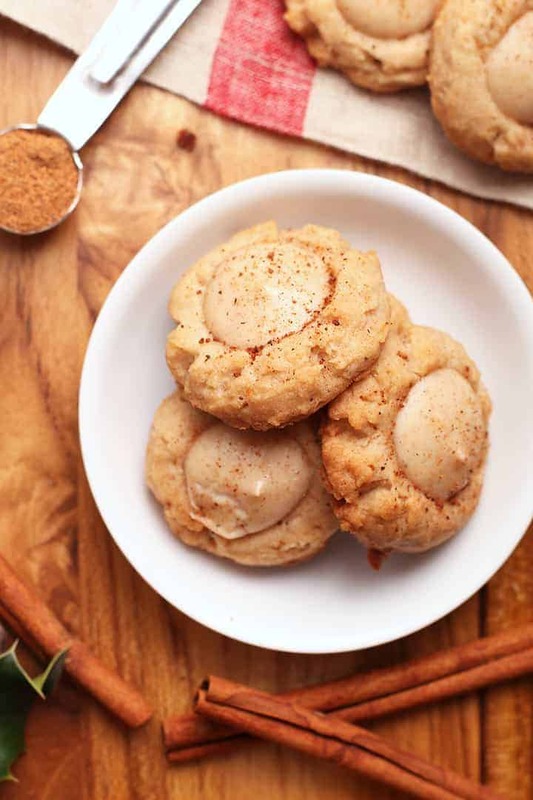 A buttery spiced shortbread filled with creamy eggnog-flavored cheesecake, these vegan Eggnog Thumbprint Cookies are the ultimate holiday cookie. Sure to impress! Start by making the eggnog cheesecake filling. In a stand-up mixer with the paddle attachment beat the cream cheese until light and fluffy, scraping down the sides as needed. Add powdered sugar and spices and mix until smooth, about 3 minutes. With the mixer running, slowly pour in holiday nog. Beat until smooth. Transfer to small bowl and chill for at least 30 minutes. In a small bowl combine flour, baking powder, salt, and spices. Set aside. Using your stand up mixer, cream together vegan butter and granulated sugar until light and fluffy, about 3 minutes. Add applesauce and beat until smooth. Add the flour mixture in three batches, scraping down the sides in between. Mix until all flour is hydrated and the dough is uniform. Using a small cookies scoop, scoop cookies and roll them into balls and place them on the prepared baking sheet. Make a teaspoon-sized indentation in the center with your thumb. Bake for 10 minutes until the edges are slightly golden. Remove from oven and make indentations again. Fill the center of each cookie with 1 rounded teaspoon of cream cheese filling so that it's slightly mounded. Bake for an additional 8-10 minutes, until cheesecake filling has firmed up. Remove from oven, transfer cookies back to a wire rack and allow to cool completely. Sprinkle with cinnamon and serve or store in an airtight container in the refrigerator for up to 5 days.